Crowley Maritime Corp. awarded four U.S. 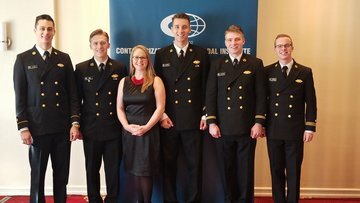 Merchant Marine Academy cadets with 2018 Thomas B. Crowley Memorial Scholarships during the Containerization and Intermodal Institute’s Connie Awards luncheon Monday in Newark, N.J.
Jenny Johnson, Crowley’s manager of marine recruiting, presented the scholarships, which were awarded to the cadets based on academic performance, financial need and interest in pursuing careers at sea. Recipient Michael Bell, second-class midshipman, is studying marine engineering systems. A native of Broadlands, Va., Bell sailed during his year at sea as an engine cadet on the Crowley-managed ships: S.S. Horizon Enterprise, MV Ocean Freedom and S.S. Wright. A member of the USMMA basketball team and the school’s Investment Club, Bell plans to have a career sailing as a licensed mariner or working in a shipyard. Charles B. Hughes, a senior midshipman is studying marine engineering and shipyard management. He is president of the school’s Class of 2019 and co-captain of the men’s lacrosse team. He has sailed aboard the Intermarine heavy lift vessel Ocean Grand managed by Crowley for the Military Sealift Command (MSC). The native of Baltimore, Md., intends to pursue a maritime career after graduation. William Quigley, a second-class midshipman from Trumbull, Conn., is majoring in maritime logistics and security. During his sea-year terms, he sailed on the Crowley-managed Washington Express as well as the USNS Tippecanoe and USNS Comfort. A member of the basketball team, he studied maritime intelligence during a summer term at the Institute of World Politics. William Wood, a senior midshipman from Budd Lake, N.J., is majoring in maritime logistics and security. During his sea year, he served on the Crowley-managed tanker Empire State, the USNS Rappahannock, and the Ocean Grand. After graduating in 2019, he plans to serve in the U.S. tanker fleet. Also, formally recognized during the luncheon was Benjamin Starr, a senior midshipman who was awarded a 2017 Crowley scholarship but could not attend last year’s Connie Awards luncheon because he was at sea. A native of Phoenix, Ariz., he is studying maritime logistics and security. He has sailed aboard vessels for MSC, Matson and Overseas Shipholding Group. Upon graduation, he intends to sail commercially as a third mate and serve as an ensign in the Strategic Sealift Officer Program of the U.S. Navy Reserve. Helping to develop the next generation of U.S. merchant mariners is of vital importance to Crowley, the maritime industry and the nation at large. The merchant marine primarily transports cargo and passengers during peacetime. In times of war, the merchant marine can be an auxiliary to the U.S. Navy, and can be called upon to deliver military personnel and materiel for the Department of Defense. Since 1984, Crowley has provided more than $3 million dollars in scholarship funding for more than 1,000 students. The company has also donated more than $2 million over the years to support other educational programs. In 1994, Chairman and CEO Tom Crowley Jr., established the Thomas B. Crowley Sr. Memorial Scholarship Program in honor of his father, who led the company to extraordinary heights before passing away in 1994. The company continues to give scholarship dollars to deserving students in the U.S., Alaska and Puerto Rico. In 2006, the program was expanded to Central America and to date, has provided financial assistance to dozens of students in that region. To learn more about the Thomas B. Crowley Sr. Memorial Scholarship program, visit www.crowley.com/scholarships .